With its inevitable stormy weather, rain and freezing temperatures, winter is finally here, sparking the return of many winter rituals such as enjoying a hot cup of tea or stocking up on warmer clothes. While you’re doing your best to avoid the ever changing British weather, your garage door will be left facing the worst effects of the season. Winter weather and colder temperatures can be problematic for your garage door, disrupting your everyday routine and causing unnecessary frustration. 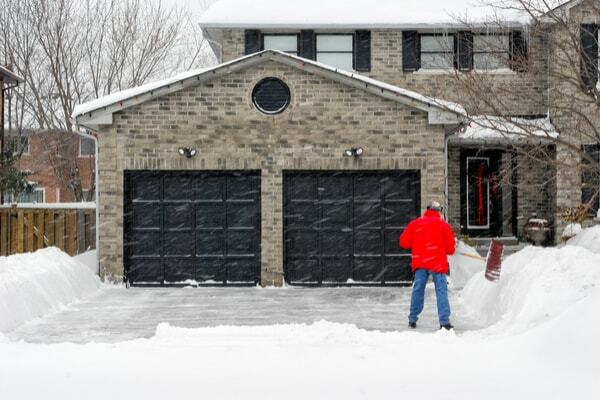 So before you relax for Christmas, here are some tips to ensure your garage door is winter ready. Britain is infamous for its excessive rain, especially during the winter. If your garage door is made of wood, increased moisture can result in swelling in both the door and the surrounding frame, causing it to rub against the frame or even become stuck. The best approach in preventing your garage door from swelling is to ensure rain gutters are kept clear to avoid run off water. If your door is made of metal, it leaves your garage vulnerable to contraction, especially during the cold weather. While you cannot prevent this, you can ease the effects through regularly oiling the springs, screwdriver and ball bearings. Although most lubricating greases are designed to operate under exceptionally hot conditions, low temperatures can cause it to harden and thicken until it becomes unusable. To prevent this, make sure you regularly maintain your garage door with lubrication and consistent cleaning to ensure it functions to its full potential. In the event of a freeze, ensure all ice is melted and water is cleared from the bottom of the door before you attempt to open it in order to keep your garage door in a good condition. The best way to protect your garage door from the harsh effects of winter would be to invest in a new door made of modern materials which have been designed to be able to withstand the cold. Our pre-coated PVC/GRP doors not only protect your car and other belongings from theft, they are also built to withstand the cold and wet winters. What’s more, they are simple to maintain while possessing a stylish aesthetic that old garage doors lack. So if you’re finding choosing the right garage door for your needs a bit daunting, contact us for specialist advice.